Bruce’s version is a little different from the original Bob Dylan version and shorter; out of the 6 original verses, Springsteen used verses 1, 5, and 6. The Chimes Of Freedom EP was released worldwide in August 1988 to promote the upcoming Amnesty International Human Rights Now! Tour. Some proceeds from the EP sales went to Amnesty International. 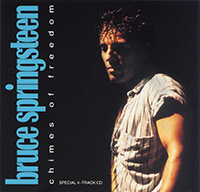 The EP was produced by Bruce Springsteen, Jon Landau, and Chuck Plotkin. Springsteen used verses 1, 2, 5, and 6. Lyrics are now closer to the original Bob Dylan version. Bruce and the E Street Band spent three days in closed rehearsals: Chimes of freedom was played on the first day, and that was the last known Springsteen rendition of the song. "Chimes of Freedom" is a song written and performed by Bob Dylan and featured on his 1964 album Another Side of Bob Dylan (see 1964 in music), produced by Tom Wilson. Initially, critics described the song as showing the influence of the symbolist poetry of Arthur Rimbaud. More recent biographers of Dylan have linked the origins of the song to verses Dylan had written as a reflection on the assassination of President Kennedy in 1963. The song depicts the thoughts and feelings of the singer and his companion as they shelter from a lightning storm under a doorway after sunset. The singer expresses his solidarity with the downtrodden and oppressed, believing the thunder is tolling in sympathy for them. Music critic Paul Williams has described the song as Dylan's Sermon on the Mount. The 19 Jul 1988 show at Radrennbahn Weissensee in East Berlin, East Germany, was announced by the promoters as a "Concert For Nicaragua", which upset Bruce and prompted him to give his infamous German-language speech prior to CHIMES OF FREEDOM.